Humane Society/SPCA shelters: Humane Societies are mandated, usually by state governments, to intervene in animal abuse situations, and to take in strays and unwanted pets from the general public. Humane Societies generally are listed in both your local white and yellow pages, and may possibly be listed in your blue pages as well. Any large metro area will typically have more than one, sometimes several. 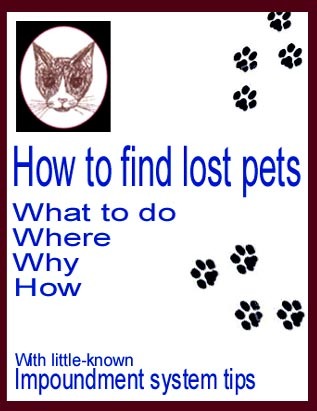 To ensure that you have not missed any, and to find many in-depth details that may be important for your particular search, review the methods used to locate both pounds and no-kill shelters, and especially read all how-to-find lost pet details regarding shelters in Section IV-c.
Keep in mind that lost pets have no conception of municipal or county borders and will cross these invisible dividers at will. Also, if kindly people pick up your pet and bring it to a pound or shelter, they will normally take it to the only one they know about, or the one that is closest to their home, or closest to where they work or otherwise venture. This could be far across one or more municipal or county borders, but still within your search area. Plan to peruse this site carefully.